If you often lose your keys, it means you need to make a little space in your house where you can put them. You can put up a key holder to keep your keys safe and always accessible. There are many creative key holder designs that you can choose or buy. But, for you who want to make a key holder by yourself, here are some easy DIY key holder ideas you can try. If you are searching for a way to slim down your keys, the key organizer is the best solution, because it will stack your keys in between two thin pieces of aluminum. To make DIY key organizer, you need some materials, such as 2 identical flat straight brackets (2 inches each), 2 sets screws and nuts (0.5 inches), and washers that have identical size with the screws and nuts. You can start making your DIY key organizer by putting the two screws into the outer most holes of the brackets. After that, add the washer and the key alternately. Don’t forget to attach the other bracket and lock it with the two nuts, and then fasten it. Finally, your key organizer is ready to use. You can flip out the key you need while keeping the rest of them securely in place. For you who want to organize your keys, hanging a wooden key holder on your wall could be a perfect solution. If you want to create it by yourself, the material you need is a piece of wood and holders. The wood will be the body, and the holder will be the place for you to put your keys. For the body, you can paint or put any decoration on the wood to make it look pretty. Meanwhile, for the holder, you can use hook or dowel. If you decide to use hooks, you will need to drill the wood first to make the hole, where you will put it. But, if you choose to use dowels, you will need a wood glue to stick it in the body part. Another perfect key holder for your house is a key holder with shelf. Steps to make your DIY key holder with shelf is mostly same as the one that without. To make a key holder with shelf, you will need at least two pieces of woods. You can use wood glue or nail to secure them together into the L shape. You need to divide the space into two parts. The first part will be the place for you to put the key holder, and for the rest, you can use as a shelf. For the holder, you can use hooks or dowels. 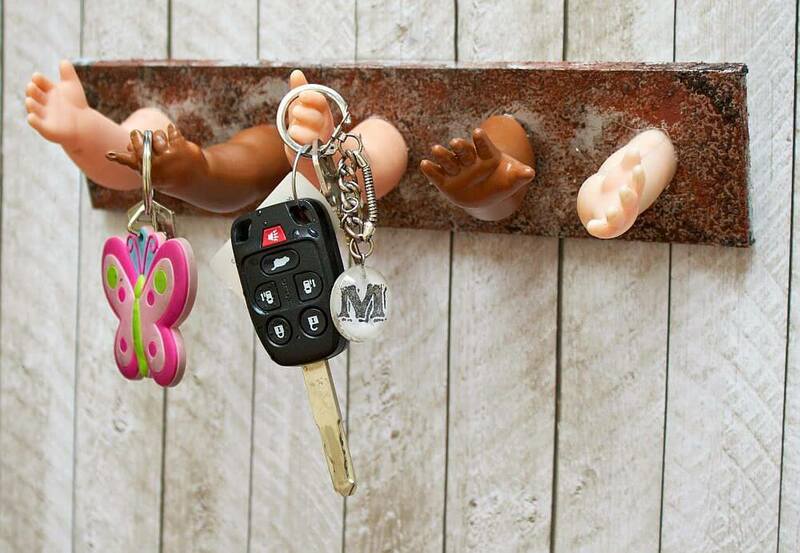 Losing your keys could be a serious thing. You can imagine if you always start the day by searching for keys around the house, it is certainly going to take time and ruin your mood. So, for you who do not have a place to store your keys, you can try to create one of the DIY key holders above.